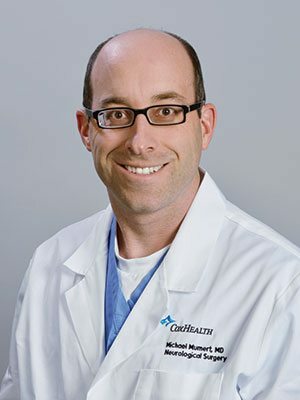 Dr. Michael Mumert is a board certified Neurosurgeon affiliated with CoxHealth in Springfield, Missouri. Dr. Mumert is a a native of Topeka, Kansas. He attended Evangel University in Springfield, Missouri as a student athlete, studying biology and competing as member of the varsity baseball team. After finishing his bachelor’s degree in 2003, Dr. Mumert went on to earn his medical degree from the University of Kansas in 2007. Following medical school, Dr. Mumert completed a 6 year neurosurgical residency at the University of Utah. Dr. Mumert spent an additional year in training at the Medical College of Wisconsin in Milwaukee, where he obtained a complex spine fellowship in 2014. Dr. Mumert joined Springfield Neurological & Spine Institute in 2014. At SNSI, Dr. Mumert practices as a general neurosurgeon, with specific clinical interests in complex spine disorders as well as brain and spine tumors. In 2018, Dr. Mumert obtained his Board Certification from the American Board of Neurological Surgery. Outside of medicine, Dr. Mumert enjoys spending time with his wife and family, pursuing outdoor activities, and closely following his favorite sports teams.